A 54-year-old man presented with a 2-month history of weight loss, fever, sweats, swelling and abdominal pain. He had diabetes mellitus, alcoholism with hepatic fibrosis and epilepsy. He came from Cambodia but had no history of tuberculosis (TB) vaccination, TB, or known contact. We found biological inflammatory syndrome (C reactive protein,141 mg/L), lymphopaenia (1.34 G/L, with a total white cell count of 5.35 G/L), interferon-γ release assay was positive and HIV testing negative. 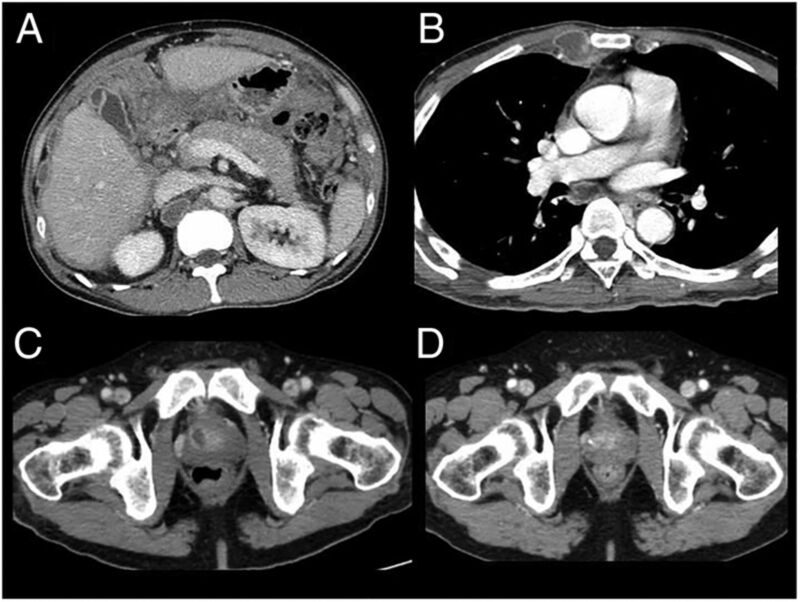 CT scan showed a nodular peritoneal infiltrate with coeliac, aortic and hepatic adenopathy, associated with prostatic abscess (without clinical signs of urinary tract infection), pulmonary micronodules of upper lobes and necrotic thoracic adenopathy (figure 1A–C). A peritoneal ultrasound guided biopsy found granulomatosis with caseous necrosis on histology, which remained sterile in culture. Mycobacterium tuberculosis was found in urine culture. The patient was cured after 12 months of classical quadritherapy (figure 1D). CT scan showing: (A) peritoneal nodular thickening, (B) necrotic thoracic adenopathy, (C) prostatic abscess before treatment, (D) prostatic abscess after treatment. Peritoneal TB is a common form of extrapulmonary TB.1 Typical histology from a peritoneal biopsy, usually performed by laparotomy or guided by echography, is essential for the diagnosis, as the culture is usually negative. Peritoneal TB is often associated with genital TB in females, but is exceptional in males. Prostatic TB is most often diagnosed incidentally following transurethral resections or prostatectomies.2 Prostatic TB abscesses have been previously described in patients with disseminated TB and AIDS, but rarely in immunocompetent individuals.3 ,4 Clinicians should be aware that prostatic TB could be associated with peritoneal TB and could help in the microbiological diagnostics of TB. Prostatic tuberculous abscesses could be associated with peritoneal tuberculosis (TB) in immunocompetent patients. Urine can reveal Mycobacterium tuberculosis in culture in patients with prostatic tuberculous abscess and peritoneal TB. The authors acknowledge Badis Menassel for his help in picture selection.
. Urogenital tuberculosis: update and review of 8961 cases from the world literature. Rev Urol 2008;10:207–17.